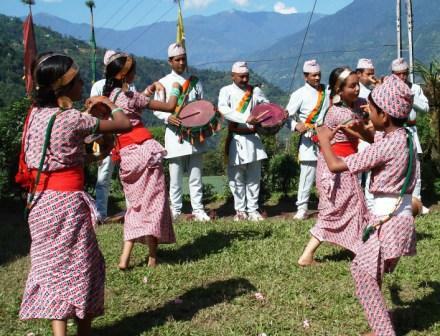 Damai dance in mid-western Nepal seeks for revival - Integration Through Media ....! Punjita Pradhan, KATHMANDU, (Xinhua): Dancing is not just a form of art and cultural expression. To a small handful of males in Jumla of Karnali district in mid-western region of Nepal, dancing is a way of living as well. Dressed in a unique way, which can be astounding not only to outsiders but to native people as well, these men play their own instruments, make their own music, sing their own songs and dance to their own beats. They wear white turbans, and their uniform comprises of a waist-coat, a red-shawl on their shoulders and a long piece of cloth around their waist when they dance. Another interesting feature of the dance is that it is only performed by males of the “Damai” community of the region. People in the damai community have customarily chosen tailoring as their profession. Theirs is among the indigenous and backward communities of Nepal. The five traditional instruments used in the performances are also unique to the region and only local dancers know how to play them. While they take tailor as their preferred profession, their dance is very significant to the region as it is performed in several auspicious occasions such as marriage, birth of a baby boy, festivals, worship and to welcome a distinguished visitor to the region. During such performaces, they collect money from the audience as their extra income. Jaya Bahadur Pariyar, the 79-year-old leading performer, told Xinhua that he learnt the dance from his forefathers at a very young age. Although he doesn’t have a clear idea about when the tradition began in his community and why only males are allowed to dance, he believes it was God’s idea. “I believe God assigned us to do it and therefore, we are doing it,” Pariyar said, adding that it is both difficult and disrespectful for women to carry the instruments and to dance in front of others. During his lifetime as a performer, Praiyar said he has performed on many important occasions including ceremonies for the former kings and monarchs of the country. “I have also received award and recognition for my performances, ” he said proudly. As a tradition, the dance is handed down to other male members of the family. All his sons can perform the dance. He has also taught the dance to his grandsons. But unfornately, the dance makes his grandsons feel embarrassed rather than proud. Sanu Pariyar, 18, the youngest of the Pariyar family, has also learnt the dance and often performs with the rest of the male. However, he says that the dancing makes him shy. “I do enjoy the dance and I like and respect it too, but I am not very comfortable to do it in front of everyone,” the junior Pariyar told Xinhua. Pariyar plans to leave his village for the cities to seek a better future for himself. The senior Pariyars are disheartened as the younger generation keeps a respectful distance from their honored tradition, but they believe that Sanu Pariyar’s decision to go out of the village will help uplift their community. Meanwhile, only a handful of people can perform the dance and carry forward the tradition. Subha Shrestha, a cultural activist, told Xinhua that such traditions should be passed on and preserved. “Karnali is a very remote region of Nepal. It does not have easy access to other parts of the world. And therefore, the culture and tradition of those places are hidden,” Shrestha said. “The Damai dance is one of the unique dances of Nepal and if it is rightly portrayed, it can be a heritage,” said Shrestha.